That’s the image the assembler has to use for all twenty steps of the installation process. And that little thing squished down at the bottom? That’s the BOM for all twenty steps as well. Hopefully the assembler has a good bookmark, because he’s going to need it, constantly flipping back to page 2 of the drawing to see what part number refers to what. Is it any wonder assemblers have a historically high turnover rate? I wouldn’t want to squint at that picture all day, every day, either. What if step 1 of the work instructions looked like this instead? Isn’t that a hundred times more comforting to look at? Isn’t it eight million times more obvious what parts step 1 involves, without having to flip pages? What did we do? Just added color, that’s all. Most detailed work instructions don’t include color images for every installation step. Why not? It might be the cost of color printing: a quick web search shows that you can get black and white copies for 3 cents a page, but color copies cost 15 cents per page, which is five times more expensive. But that’s also just 12 cents more expensive, so keep it in perspective. How much does an assembly error your shop floor cost you, on average? More than 12 cents? Related is the objection “We can’t have a picture for EVERY assembly step; our instructions would be a hundred pages long!” Have you ever tested how much heavier a 100 page PDF is to carry around versus a 5 page PDF? Not much difference. Usually the word “paperless” comes up here, but no matter how you integrate color into your instructions (either by paying a whole 12 cents more per printed page or by making the “huge investment” to make your high-tech, cutting edge factory barely equal to the mass-market cell-phones all your workers carry into the plant each morning), let’s take a look at some of the benefits of color. Color improves comprehension by 73 percent. With color, we can get rid of those extremely-easy-to-misread octopus tentacles that always stretch from balloons to parts, since now it’s obvious what parts we mean. How much better would that make your manuals? 73 percent better, if studies are to be believed. Color allows subtle contrasts and thus more data per image. Color is how humans are built to make distinctions between separate shapes close together, which is why we use it in maps. Why not make your work instructions as information dense and as easy to read as the best road atlas out there? When most people try to apply color, they immediately go for the big stick: red. But red is very overpowering for humans, which is why your eye keeps flicking back to that red word in the previous line even as you try to pay attention to these black and white words. Why is red so potent? One theory is that it was the main way early primates identified ripe fruit in the forest, making it a huge evolutionary advantage to spot red before the next guy. Compare that to the first image in this post, and think about which one you’d rather deal with every day. Aall the images shown were created with SolidWorks Composer, a new product that lets you take your 3D CAD data and create useful, colorful images in half to a third of the time as you’re spending to make black and white ones now. And they update when your model changes. Next time: Text versus pictures: which one is best for what task? 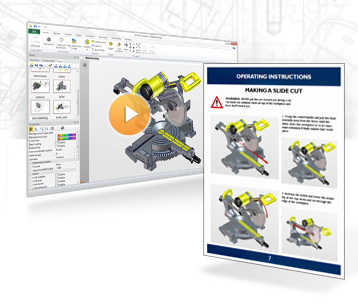 For more information on how SolidWorks Composer can help you create technical publications quicker and easier, check out our User Manual video series. Shuvom Geose is an Account Manager at CAPINC, a SolidWorks Value Added Reseller with locations across New England. He is a regular contributor to their CAPINC University blog.